While more attention than ever is given to the Western history of African art these days, the African part of these objects voyage to the West still remains largely ignored. Recent books on topics as Dogon art or Djenne terracottas once more graciously evaded the question of the featured objects’ provenance – it remains a very sensitive subject. However, my curiosity was met when I recently discovered a very enlightening (& scientific) article by Cristiana Panella in the European Journal on Criminal Policy and Research. “Looters or Heroes? Production of Illegality and Memories of ‘Looting’ in Mali” explores the clandestine trade in antiquities in Mali by showing on one side the social organization (techniques, hierarchies, trade chains) of farmers-diggers; on the other side, by analyzing the rhetorics of illegality driven by official cultural heritage policies. At the end of the 1950s, Satimbé was a farmer in his village in the Dogon countryside. Around 1958, when he was in his 30s, he started work as a prospector for a Sarakole dealer to whom he would sell wooden objects for between 100 and 500 FCFA each (the price of a goat), that the dealer would then export to Burkina Faso. 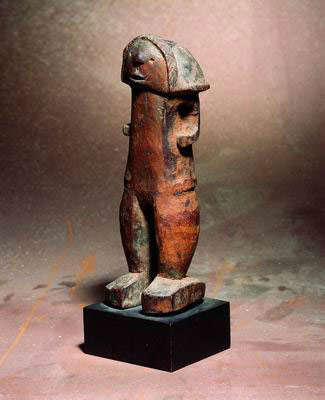 The first object Satimbé sold the dealer for 500 FCFA was a wooden Dogon horseman. When the Sarakole dealer came back from Burkina, he offered Satimbé a commission for 5000 FCFA. Satimbé used to go to the rock wall with scaffolding and a rope allowing him access to the inside of the cliff. Thanks to his mastery of the Bandiagara Cliffs as well as to his courage, he became an incomparable prospector of Tellem, and more generally, wooden objects. 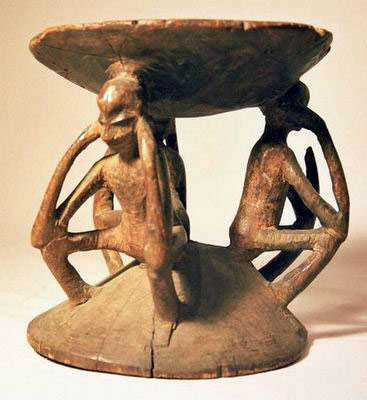 At a time where tourism was not so developed in the Dogon country, people feared Tellem objects, unlike Dogon sculpture), so that only a limited number of prospectors specialized in their collection. From 1958 to 1970, Satimbé prospected only ‘woods’. After 1970, however, he stated that very good wooden pieces started to become rare. 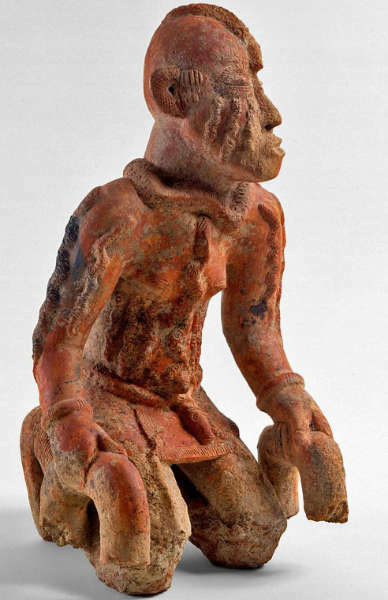 Satimbé saw ancient terracotta statuettes for the first time in 1968 at a stall in the Mopti Grand Marché. The owner of the stall was selling finds from surface collecting to visiting Europeans. It was at this time that Satimbé started collaborating with Drabo, a dealer who had just settled in Sevaré. In 1968, Satimbé went to Sevaré to sell a group of objects and met Drabo, who was very interested in buying them. Nevertheless, Drabo could not afford the 300.000 MF that Satimbé was asking and he proposed instead going to Bamako to sell them. Satimbé accepted this offer, and after Drabo’s return he received his requested price of 300.000 MF (which must mean that Drabo had sold the group for much more than 300.000 MF). At this time, Drabo was not familiar with the region and he was lacking prospectors, so he asked Satimbé to work with him, especially to obtain wooden sculptures from the Dogon cliffs. One of Drabo’s most important customers, a Belgian collector, was able to give Dolo (the most important dealer for Satimbé in the Mopti region) and Satimbé 50 million MF to fund the acquisition of high quality wooden pieces. Thus the demand for terracotta first developed within this wider and more prestigious market of wooden objects, and several rural middlemen shifted into the terracotta market. For instance Souleymane started as a wooden objects dealer in 1970, trading at Bankass, Sevaré and Bandiagara, where he was settled, especially supplying Mingali, Sangha, Dourou, Kendié and Kani Bozo. 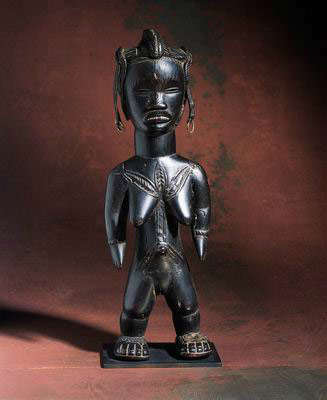 He sometimes bought new replica pieces that he would artificially age in order to sell them to urban dealers in Bamako. Starting in 1975, the first digging teams started to be established. Satimbé stated that some teams had already appeared in 1968 but that he himself had only started to work as a digger of terracotta in 1970, when he dug a site between Sevaré and Mopti. 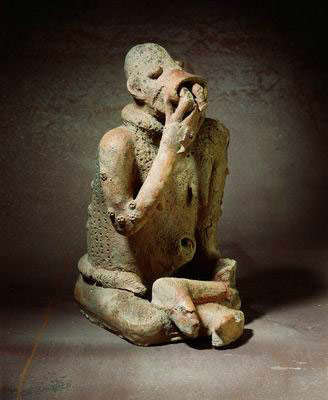 He found his first terracotta on the second site he dug, in the area of Djemandaka. Panella continues to explain how the diggers work and their techniques of exploiting archaeological sites (pp. 493-497); you can read the full article here. This entry was posted in Research and tagged Djenne, Dogon, Tellem on March 1, 2015 by admin. 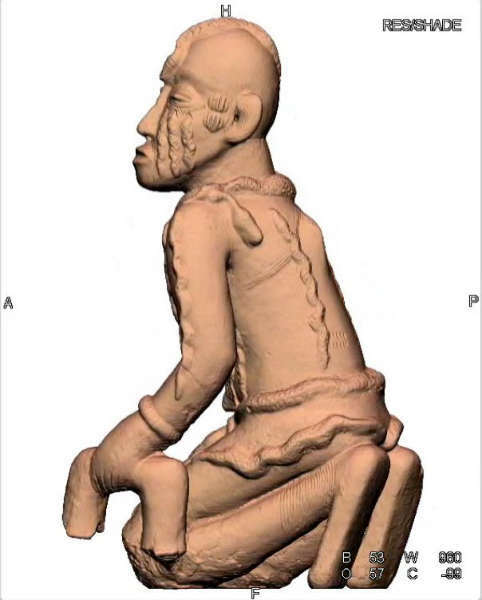 Though inactive since November 2011, this videoblog “Djenne Terracotta” features some amazing views of Djenne figures from the Inland Niger Delta in Mali. A project of the radiologist Marc Ghysels, 100 terracotta objects from both public as private collections are presented accompanied by an opaque rotation video 3D CT scan. Highlighting the details from all corners, one gets a much better understanding of the threedimensional sculptural qualities of these objects. Worth a visit. This entry was posted in Research and tagged Djenne on May 23, 2013 by admin.